Personal Branding Training Materials are designed for trainers to help employees and businesses manage their personal brand. Confidently teach staff what is in a brand, how to approach a brand style assessment, communication strategies, build credibility and more! Seeing is Believing This sample manual to teach Personal Branding is in MS Word format. With all the attention that we pay to corporate branding, it makes sense to help individuals see what they can do to help bolster their careers and the personal brand. 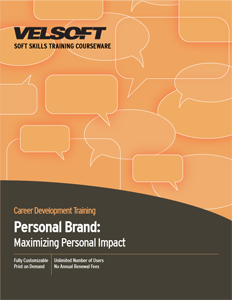 Personal Branding Training Materials is a two-day course, and includes topics like focus and concentration, characteristics of dress and voice, and having influence. Participants will also explore what their impact is in terms of their own actions, preferences, and style. These training materials include a detailed instructor's guide, a student's guide (including a recommended reading list), a quick reference guide, and more. For your distance learners or technologically motivated students, you can also make use of blended learning to add impact to your training.